Fall and winter start the decline of a patio or deck from a cool place to hang with friends and family to a cold, desolate place coated in leaves and snow. However, there are several things you can do to make sure the patio is ready by spring, instead of being in a dismal state when the thaws finally come. Here are some tips to properly pack up and get your patio ready for winter, or even to make sure that the party never stops. It’s easy to forget stuff outside on your patio, especially after a few weeks of gloom, rain, and falling leaves have made you want to avoid the outdoors altogether. However, for chairs, tables, and other patio accessories it’s important to get them cleaned off and stored. The last thing you want is to find a seat cushion destroyed by mildew, or abandoned tools rusted solid. Make sure to take stock of your patio and get what you can cleaned off and stored away from the water and ice of winter. The more work you do now, the less you’ll have to do in the spring. Instead of having to scrub off decayed leaves months later, take some time right now to clear off the patio. Use a hose with a sprayer attachment or a pressure washer to clear off summer grit and fall debris. If you’ve got a grill, now’s the time to burn off the last of the BBQ and scrub it down and cover it to avoid a rusted mess when you’re ready to grill in warmer weather. Of course, just because it’s cooler out doesn’t mean you can’t use your patio still. If you keep it clean and put away the summer umbrella, you’ve got some options into keeping this outdoor living space up and running until the snow starts falling. You can get eaves, screens, and full-blown enclosures for a patio you just don’t want to give up to the elements. These allow you to not only keep bugs out during the summertime, but also the cold rain. Enclosures can be incorporated into current or new patios to make it an additional interior room of your house. Who doesn’t like a good campfire? 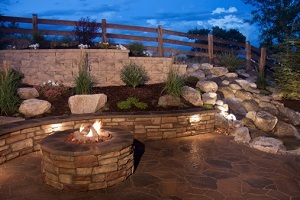 Addition a fire pit to your patio or incorporating one into a new design can add months of life to your patio use. Adding a heat source can turn a cool autumn day into a cozy adventure in your backyard and a chance to bring your patio into a fall or wintertime party. When it comes to planning out your backyard experience, think about contacting a landscape contractor for more ideas. Greener Horizon specializes in creating outdoor living spaces to use year-round, from patios and walkways to sculptured lawns and retaining walls. Want to know what we can do for you? Contact us for a free consultation.